Clara and I met in architecture school at UT Austin over twenty years ago. We started dating during the summer of 1998 when we both worked near downtown Austin. 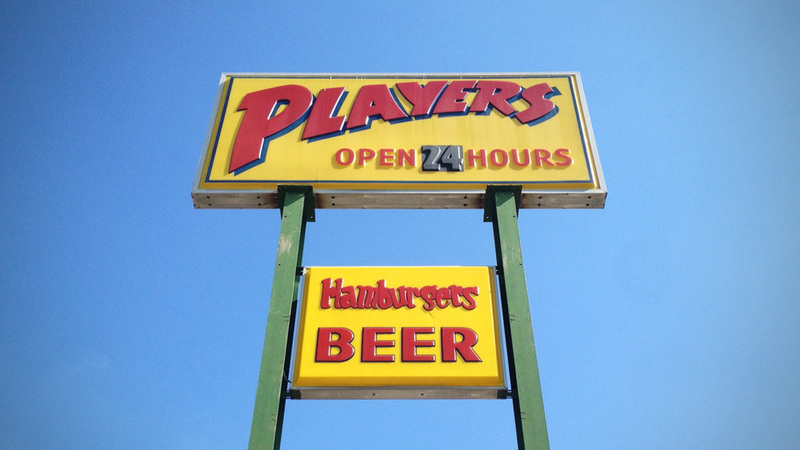 We'd meet for lunch and, well, one thing led to another. After graduation we spent our mid-to-late twenties bouncing around the country pursuing jobs and graduate degrees before we both ended up is San Antonio and decided it was time to get married. And so on September 9, 2006, that's exactly what we did. It's been a busy decade since then. We together left old jobs and we started new ones. We together made car payments and we made mortgage payments. We together had kids and we changed diapers - lots of diapers. We together have sought to design a life for ourselves and our family. I suppose every family does that regardless of if they are architects or not. The life we together have created isn't perfect - nothing ever is - but it's been a really good run so far. I know my life has been vastly improved by the fact that I've been able to share it with such a good friend / lover / wife / fellow parenting / partner in crime. It's been a fun ten years so far. I look forward to the next ten years together and all the adventures it might bring. So one of my Mother's Day gifts to my wife was to leave town with one of our kids (the loud one) so she could have a slightly more relaxing evening day than normal. And so Sammy and I headed out to Bastrop State Park east of Austin and stayed at one of the great cabins located there. Built in the 1930s by the Civilian Conservation Corps, these elemental cabins are near-perfect hand-crafted architectural haikus. Using rough-hewn stone gathered locally, the cabins literally appear to grow out of the ground rather than be placed upon it. Built at a time when labor was cheap but materials were expensive, the buildings represent a very different sensibility than most buildings do today. 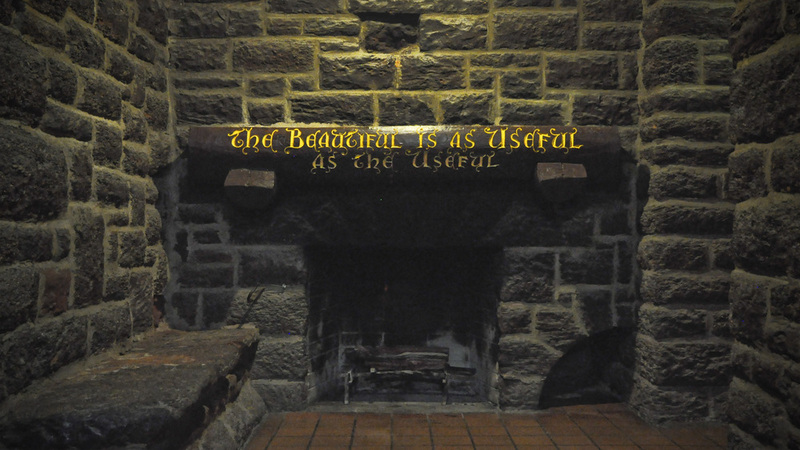 "The beautiful is as useful as the useful." It's been a busy few weeks and I'm still catching up on things that happened last month. 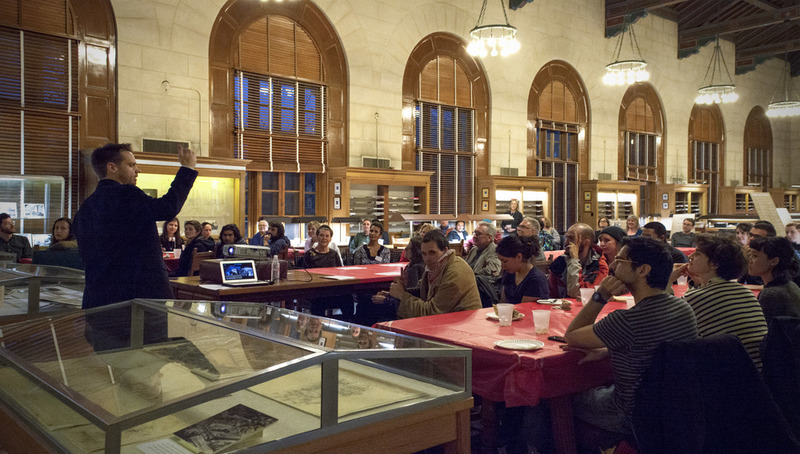 At any rate, back on February 16th I had the opportunity to speak at the University of Texas at Austin. The Alexander Architectural Archive started this really cool program where they display some of the drawings in their collection for students (or whoever) to see. At any rate, this moth they displayed some of the original drawings of O'Neil Ford's Little Chapel in the Woods and they asked me to give a short talk about the building and its significance. Attendance was really good and although I'd like to think that had something to do with the content of the talk, the fact that there was free pizza was probably the real reason. So a few weeks ago I was in Austin for a meeting and decided to stick around for a lecture at the University of Texas School of Architecture. I had heard Wendell Burnette speak about ten years ago and had also had the opportunity to see several of his projects in the Phoenix area. I have always respected his ability to transform common materials and common building types into exquisite architecture. His projects were always a inspiration that showed it was possible do a lot with very little. Seeing him lecture again I saw a few of the older projects I was familiar with as well as some of his newer work. These more recent projects reflected Burnette's aesthetic and attention to detail, but the budgets he was working with were obviously much larger. It's not that the work wasn't as good, it's just that there are plenty of architects out there doing good projects that cost a lot of money. It is much less common to see good work being done with modest means and I regret the loss of one of the few architects doing that sort of work. Doing good architecture is hard. Having ample budgets makes that job a little easier but in a way it diminishes the relevance of profession. If architecture is understood to be merely a plaything of the privileged, then its value as a social art is reduced to that of a designer watch or a luxury automobile - sure the craft and the performance may be exquisite, but if only a small percentage of the population are able to appreciate it, is it worth it? 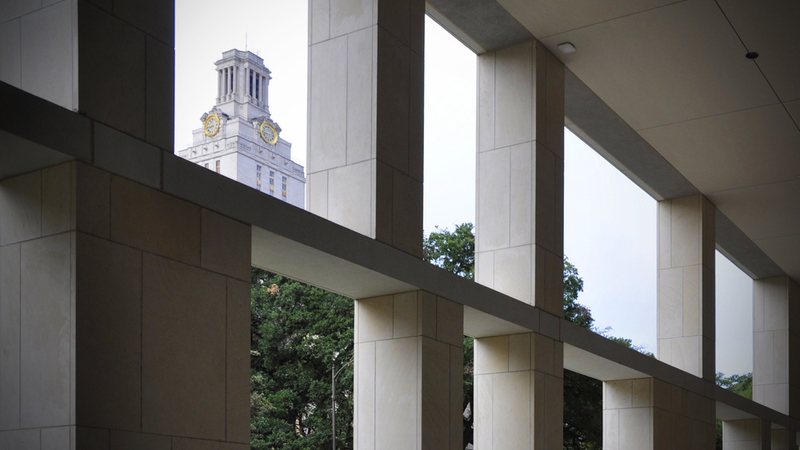 On the western façade of The University of Texas at Austin Goldsmith Hall are inscribed the names of four architects. The first three are obvious enough. Ictinus designed the Parthenon. Vitruvius gave us the concepts of "firmness, commodity, and delight" in his ten books on architecture. Palladio may have only written four books on architecture, but the buildings he produced defined the direction of western architecture for the next 300 years. The fourth name on that wall was always a bit of a mystery. The inscription read "Goodhue," but that name was not a familiar one. It was not mentioned in our history courses, and none of our design professors ever instructed us to look up the work of someone by that name. The library contained no monograph of his work, and so in the days before Wikipedia, we were all left asking the question, "Goodwho?" When I graduated from UT in 2000, I moved to Chicago to begin my professional career. While there I volunteered as a tour guide at Frank Lloyd Wright's Robie House which, as it turns out, sits about 400 feet from University of Chicago's Rockefeller Chapel. This colossal gothic pile was designed by a New York architect by the name of Bertram Goodhue. A few years later on a road trip through Nebraska, I found myself in Lincoln, where I explored the state's towering Capitol Building that this same Goodhue fellow had designed. Once I had returned to Texas and was working at Lake|Flato, I designed a middle school at Cranbrook in the shadow of Goodhue's Christ Church of Bloomfield Hills. It turns out that Bertram Grosvenor Goodhue was a rather prolific American architect working at the turn of the twentieth century. Although he was just a few years older than Wright, his architecture took a much more traditional path. As a virtuoso of revival styles, he produced designs in Gothic, Spanish, Romanesque, and many other modes. If modernism had never happened, Goodhue would today, no doubt, be considered a luminary on par with the likes of Ictinus, Vitruvius, and Palladio. But modernism did happen, and his name has become a footnote. But I have found that the footnotes of history can teach just as much as the pillars that traditionally define it. 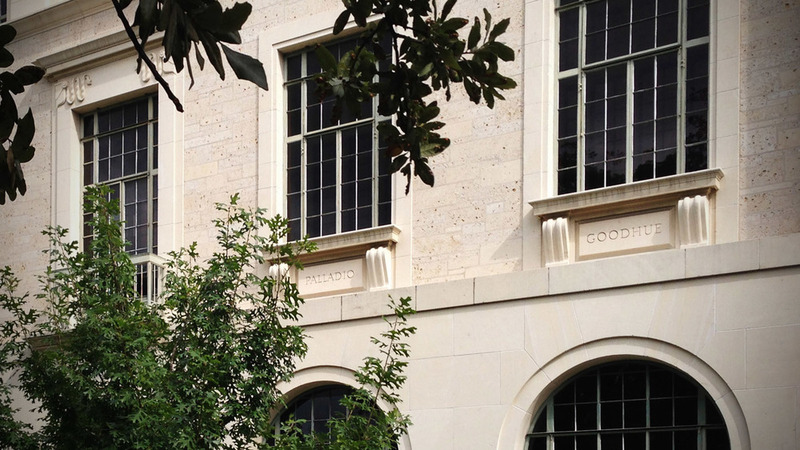 In my years as a student at UT, I may not have learned exactly who the man was behind the fourth name on the wall at Goldsmith, but I did learn to embrace the inherent incompleteness of my education and become an eternal student of architecture. No student ever graduates knowing everything—I certainly did not—but at UT I was taught to appreciate the unknown and enjoy the process of exploring. Thirteen years after graduating from UT, it is easy to become bogged down in the grind of practice. But there is nothing more inspiring than discovering an architect whose work may be very different from mine, but whose ideas still have relevance today. I may never design a gothic church in Manhattan, but I can appreciate the ingenuity of how Goodhue modified historic precedent to address the specifics of the site. I may never design a library in a hybridized Egyptian and Mediterranean style, but I can appreciate Goodhue's attempt to assign appropriate stylistic approaches to new cities and programs. 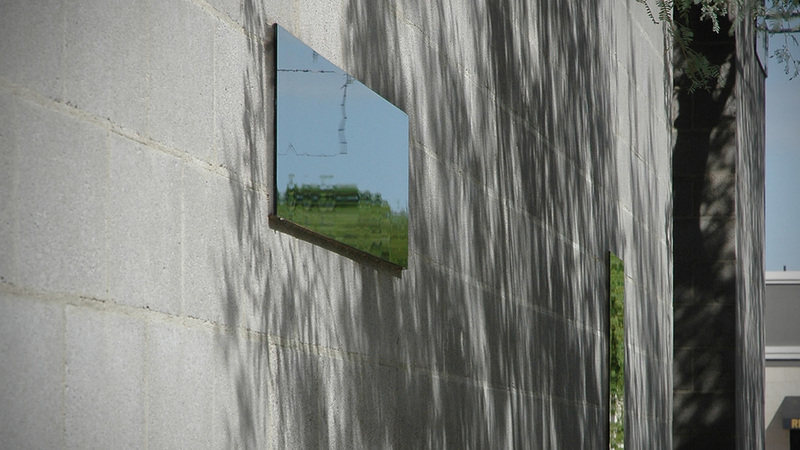 I may not always recognize the names of dead architects chiseled onto the sides of buildings, but I can certainly enjoy the process of discovering the work that earned them a place there. *A version of they essay first appeared in the December 12, 2013 edition of the University of Texas School of Architecture's eNews bulletin.